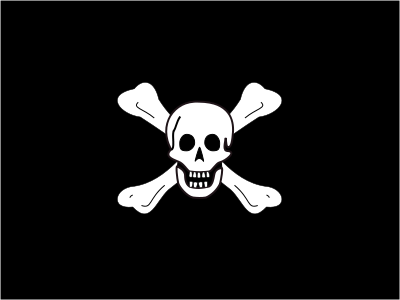 In the early 17th century, “Jolly Roger” has been a term used for a cheerful, friendly fellow but it seems like that has nothing to do with the vicious and dangerous pirates and the flags that decorated their ships. So how and when did this term started to identify pirate flags? Historically, the skull and crossbones symbol was used by pirate ships to inform the targets they’re about to attack. In his book, Johnson mentions two pirate captains that had called their flag “Jolly Roger” – Bartholomew Roberts in 1721 and Francis Spriggs in 1723. Both of them used the same expression for their flags, although they were both different and neither of them had the skull and crossbones on it. 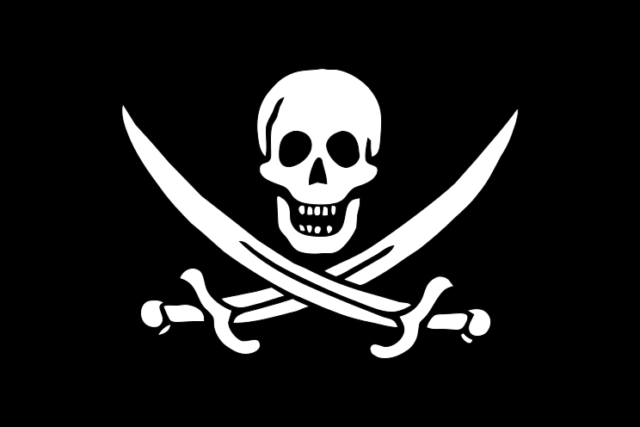 This means that the term “Jolly Roger” had already been for the good old black pirate flag in any shape and not only for today’s common design. A testimony from a man who was captured by pirates in 1724 supports this idea. 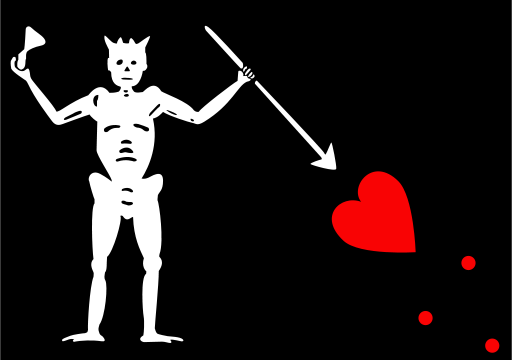 He witnessed a pirate flag with a skeleton stabbing a heart with a spear, which the pirates called “Jolly Roger,” being rose on the ship’s mast. As previously stated, the term “Jolly Roger” already existed in different connotations. In a naval report from 1703, it was mentioned in regard to a pirate called John Quelch who was sailing under the “Old Roger” off the coast of Brazil. “Old Roger” was devil’s nickname, so presumably, this term was later modified to signify the grinding skull or skeleton in pirate flags – also a symbol of the devil (or death). Another theory suggests a different etymology of the term. Some scholars claim that it is based on the expression “Jolie Rouge” (“Pretty Red”). They base this conclusion on the fact that French privateers used a red flag on their boats. This can’t be proven because “Jolie Rouge” hasn’t been mentioned in any historical document regarding pirates. This trademark, the skull and crossbones symbol, has first been recorded on flags from the 17th century. It is believed that the idea was borrowed from the designs on the flags of Barbary pirates (Ottoman corsairs) that used to operate under a green flag with a skull symbol. The black color of pirate flags suggests the Muslim black banner, but this is only a presumption. One of the earliest reports of the skull-and-crossbones design dates back to December 6th, 1687 in a logbook entry. 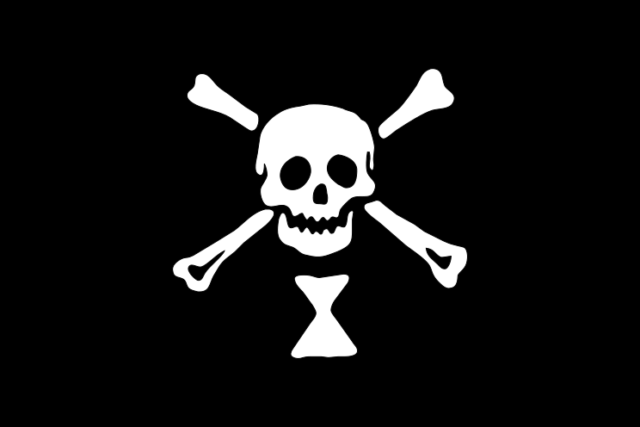 In the log, it is said that this type of pirate flag was used on land instead on a ship. 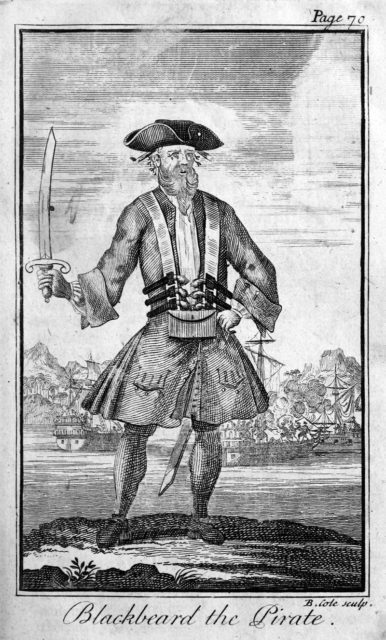 Emanuel Wynn, a French pirate captain, is often credited as the first pirate to use the Jolly Roger. In his design there had been an hourglass under the skull and crossbones, as stated in the British Admiralty report from 18th July, 1700. According to this report, a ship called HMS Poole engaged Wynn’s ship which was carrying the previously mentioned flag. After the end of the War of the Spanish Succession (1714), piracy took a huge swing. 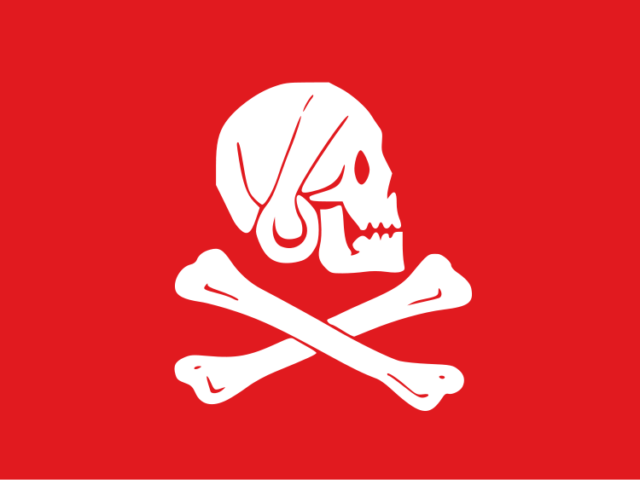 Pirates often used red and black Jolly Roger flags which were uniquely decorated. The images depicted on the flags usually symbolized death or the devil. The black Jolly Roger banner was not always used on a ship. Pirates had many different flags and regularly sailed under false colors. The Jolly Roger was shown only when the prey was within firing range. They used to raise it and fire a warning shot. It was used as a signal and identification. The victims had the option to surrender or resist. If the ship decided to resist, the black Jolly Roger was changed with a red one. This meant that they wouldn’t show mercy and will take the ship without any prisoners. The Jolly Roger was more than just a fancy flag- it was an emblem. A real proof that someone is a pirate. A captain didn’t need to wave his flag to prove that he is a pirate, it was enough to have it on the ship. Those who dared to raise it had nothing to lose and were already ready to be arrested or executed.